The best ideas for winning come from the people on top. When you win championships you win respect. Especially when you win back-to-back championships. That’s what the Miami Heat has done. Everyone has ideas, but when you pick up ideas from champions, you have to pay a little more attention. This year the Miami Heat know they have a problem. They can’t do the same things they did last year and expect to win. They have to fight complacency. They have to find ways to challenge themselves to stay mentally tough enough to stay on top. They’ve got to get better because every team in the league is improving and coming after them. Every slight weakness they’ve demonstrated in the past is common knowledge for the other team, and they’re planning to attack those weaknesses and win. If Miami wants a third championship, they have to drive themselves to the limit to improve. That requires fresh ideas. So what book did Coach Eric Spoelstra hand out to everyone this Christmas? 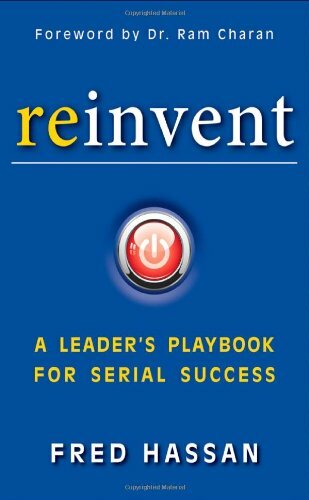 It was Fred Hassan’s Reinvent: A Leader’s Playbook For Serial Success. The world is full of hundreds of millions of books Coach Spoelstra could have given them, but he chose this one. There are probably some really good reasons why. Get this book and get some ideas for “reinventing and improving” yourself and your team in 2014 because it’s time for you to win your championship too.